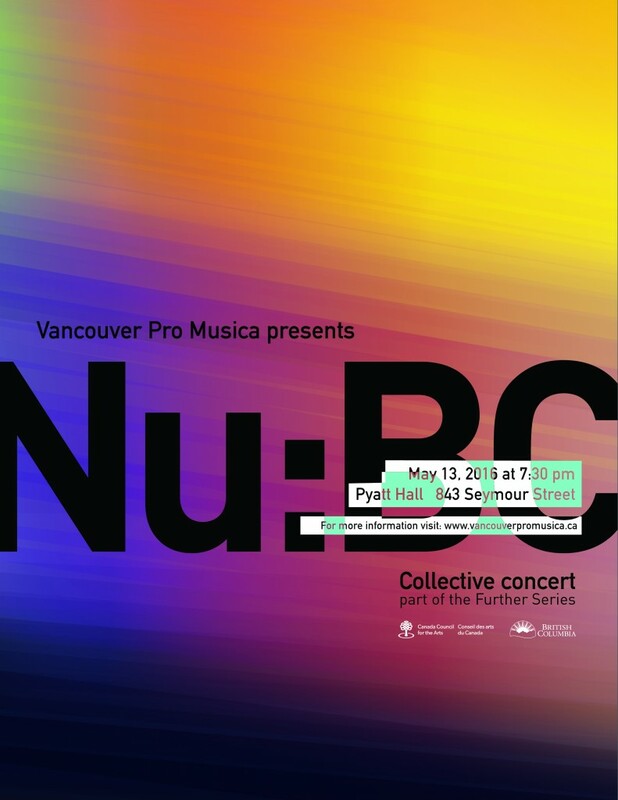 Vancouver Pro Musica is pleased to invite all BC composers to submit new works for presentation at our Further Series concert on May 13, 2016, featuring the Nu:BC Collective. Deadline for submissions is March 11, 2016. Additionally there will be a free workshop with the ensemble on January 9, and an open reading session for pieces chosen for the concert on April 3. Described in the Vancouver Sun as “a dream gift…One of the best additions to local new music circles”, The Nu:BC Collective brings together the spectacular talents of flutist Paolo Bortolussi, cellist Eric Wilson and pianist Corey Hamm, joined frequently by such eminent artists as violinist Jasper Wood, violist David Harding, and clarinetists Francois Houle and Cris Inguanti. Now in its ninth season as an ensemble-in-residence at the University of British Columbia, Nu:BC has presented critically acclaimed concerts featuring repertoire by exciting and influential contemporary composers from Canada and abroad. Nu:BC has presented masterclasses and concerts at the the University of California (Davis), Cal State Fresno, the Universities of Illinois, Alberta (Edmonton), Calgary, and Western Washington, Wilfred Laurier and Roosevelt University, the Music on Main series in Vancouver and the Washington Composers Forum. Recent projects include the premiere of newly commissioned works by Gabriel Dharmoo, Edward Top, Dorothy Chang, Keith Hamel, Bob Pritchard, Brian Cherney, Chris Paul Harman, Scott Godin, Taylor Brook, and Michael Oesterle, as well as the recording of their first CD, “Beyond Shadows”, featuring works by Brian Cherney, Dorothy Chang, Chris Paul Harman, and Marc Mellits. The upcoming season features the premiere of a new trio by Dorothy Chang, a new triple concerto featuring the Nu:BC Collective as soloists with the Turning Point Ensemble, an innovative transcription of Mahler’s seminal work Kindertotenlieder by Alfredo Santa Ana, and the premiere of Ana Sokolovic’s arrangement of her piano trio Portrait Parle, for flute, cello and piano. Submissions must be received by 11:59 pm on Friday, March 11, 2016. Vancouver Pro Musica will contact all the submitters by late March 2016. While Pro Musica wishes to be as inclusive as possible, production costs, time constraints, and other practical concerns may require that not all submitters will have a work selected. In the event that these considerations do not permit the performance of all submissions, Vancouver Pro Musica will employ a panel of professional composers not associated with Vancouver Pro Musica to guide selection. Decisions of the panel will be final. January 9, 2016, 10am–2pm: Open workshop at the CMC BC Creative Hub. March 11, 2016: Score submission deadline. End of March, 2016: Submitters notified of selection results. May 13, 2016: Concert at Pyatt Hall, VSO School of Music.